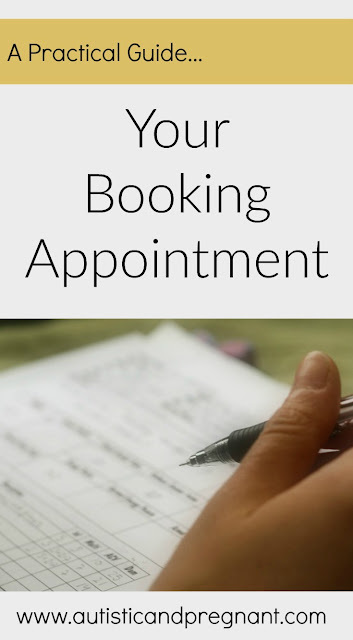 A booking appointment is usually your first contact with your midwife. It involves 'booking' you into the system and collecting a wide variety of health and lifestyle information from you and your partner. You are also required to submit a urine sample and blood samples will be taken. My booking appointment took place at a local children's centre. The building and it's surroundings were rather depressing to look at and in all honesty didn't feel welcoming or safe but that will differ depending on your area. Once we accessed the building via reception we were asked to sign in. We were asked to write our details on a sheet of paper that was on the front desk and was easily available for anyone to read. We could easily read everyone who had been to the centre that day- not a very good system for those wishing to keep their pregnancy quiet. I was then handed a cardboard device with a urine sample pot inside. As I wasn't expecting this I felt rather silly as I must have looked bewildered. The staff weren't concerned that this was my first experience in such a place and it was only when I mentioned that I hadn't been before that we were shown to the waiting room and I was directed to the toilets. As I wasn't aware that a urine sample would be needed I had been to the toilet before leaving the house so I feel it's important to share that every midwife appointment will require a urine sample. After a short wait we were called through to the midwife's office. It was a small room with a desk, a bed and two chairs for us to sit on. Ordinarily your first contact will be with the midwife you have been allocated throughout your pregnancy. In our case our midwife had been working overnight on an emergency and so our booking appointment was handled by a cover midwife and a trainee midwife so be aware that you may not be meeting with who you expect- this could happen at any midwife appointment throughout your pregnancy. Emergencies happen. If seeing the same midwife is important to you, you may have to move appointments to accommodate their schedule. It is up to you to decide which is more distressing for you- changing the appointment or seeing a different person. For me personally it is changing the appointment, I would rather see a different person than prepare myself for an appointment to then have to prepare myself all over again. The main purpose of the booking appointment is to gather medical and lifestyle information from you and your partner. There are a lot of questions, some of which are quite intimate. Just remember that they are asking these questions with the health of your pregnancy in mind. They aren't going to judge you. The midwife will then weigh you and take your height in order to determine your BMI. Your BMI reading helps the midwife to decide whether you are classed as having a higher risk pregnancy based on if you are over/underweight. Your blood pressure will also be taken at your booking appointment. This is done to ensure your health and to help identify any indicators of possible complications or illnesses. Blood tests will be taken around the time of booking. Where this occurs will depend on your local area. The centre I attended had the facilities to conduct blood tests and both the trainee and the midwife attempted to take my blood several times in each arm but due to me being dehydrated it proved impossible so I was given a form and sent to the blood department of my local hospital in the hopes that they would be successful. After several attempts they managed to get all the samples they needed. I was given the results of these at my 16 week appointment, I believe that if there was any cause for concern I would have been contacted much sooner but as my results were fine it wasn't necessary for me to be notified. You will be given the opportunity to talk with your midwife about any concerns you may have. The midwife should explain to you about the prenatal vitamins you should be taking, the screening tests available as you look towards your 12 week scan and they will provide you with a list of foods that are advisable to avoid during pregnancy. I was also provided with a Bounty folder that contained booklets and leaflets offering advice on how to best take care of myself and baby during the first few months. The bounty booklet also offered more in depth information on the types of screening available. We also arranged a date for our 16 week midwife appointment. I had to wait until the end of the appointment to hand over my urine sample as I just didn't need the toilet before.I now make sure that I am able to produce a sample when I first get to the clinic. When handed the sample the midwife will dip a strip of paper into the sample and the paper will change colour according to what is present in your urine. These 'dipstrip' results are available immediately. As this was my booking appointment the sample was sent away for more rigorous testing. The results of these were given to me over the phone around a week later as they showed abnormal growth. If my results had been clear I wouldn't have needed notifying. Booking appointments typically last for at least an hour. You may not see 'your' midwife- emergencies may mean that the midwife you expect to see may not be available. You will be required to provide a urine sample. Your blood pressure will be taken to determine your health and look for indicators of complications. You will be required to have blood samples taken. Use this time to voice any concerns you maybe having. There are no stupid questions so please don't worry about embarrassing yourself, midwives are there to help and reassure. You will be asked a lot of questions. Be honest about your health. I didn't receive any judgement from the staff when sharing my intense mental health history. They are there to help and an accurate record will help staff understand your needs further down the line. Booking appointments can be overwhelming. They involve a lot of sharing information and can mean talking about things that make you uncomfortable so plan something that makes you feel good for afterwards, whether that's a cuppa in your pjs or a trip to your favourite restaurant. Now is the time to take good care of yourself.